Recorded as Hindenburg, Von Hindenberg, Hindenberger and Hindsberg, this is a famous German surname. 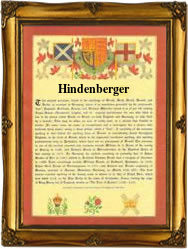 It is locational and either describes a person from the town of Hindenburg or one who lives there. It is said that the place name means either the hunters castle from the pre 7th century words ''Hunta-burg" or possibly it may be tribal, and refer to a warlike people called the Hinta who may have inhabited the place in the 5th century. Locational surnames throughout Europe are often status names and this is no exception. These were names held by the original lords of manor or region, and their later descendants, or in most cases the names of people who had left their original town and had settled somewhere else. In so doing they were most easily identified by the nam eo their former home. The late President Paul von Hindenberg who died in 1933, was the scion of a noble family who, it was claimed, could trace their ancestry back to Teutonic knights of the 13th century. Be that as it may, the surviving church and charter records are somewhat later, and examples from these include: Leonard Hindenberger of Feldkirch in the year 1503, and a century and half later that of Peter Hindenburg of Massow, Pomerania.